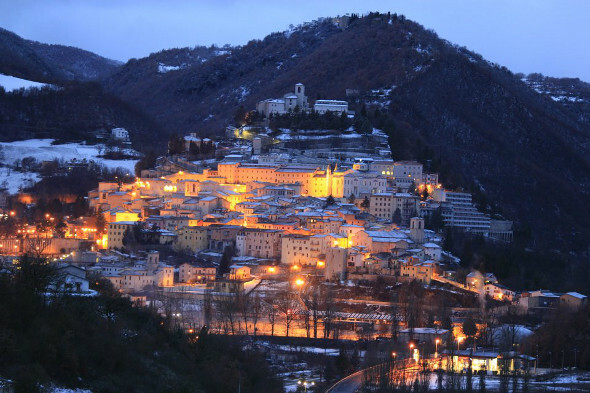 The town of Cascia is situated at 563 meters above sea level near the Corno river. Cascia was founded during Roman times, even if nothing remains which remembers those times, due to devastation by barbaric tribes and the earthquakes which have always disturbed the town and the neighbouring cities. 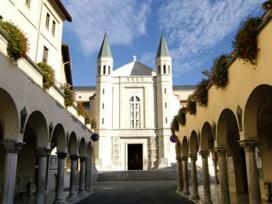 As with the major part of the Umbria's towns, Cascia experienced its period of major splendour during the Middle Ages. Formerly under the dominion of Foligno, it later passed under the rule of Frederick II of Swabia. Later, the neighbouring cities of Norcia, Leonessa and Spoleto unsuccessfully fought over the town. Finally, only at the beginning of the 16th century, Cascia surrendered to the Papal State under whose rule it remained for less than 30 years. >> Do you want to visit Cascia? Check it out now of the best farmhouses and hotels in Valnerina. There are offers for vacation rentals and hotels in the areas of Cascia! Click and Consult them immediately. After that, it has always maintained its independence. When speaking of Cascia's history, it is necessary to mention its most illustrious personage, who illuminated the city and rendered it famous all over the world, even today: Saint Rita of Cascia. This nun, who was beatified in 1900, lived from 1381 until 1457. Respecting her father's wishes which led her to marry and not to enter an Augustine convent, as she would liked, St. Rita lived in continual terror of her husband for 18 years. Her exemplary life induced even her husband to convert. Her life had a tragical end; she died in mysterious circumstances. Her children also died soon after. Nowadays this Saint, who is known to grant wishes, is venerated all over the world and many pilgrims undertake the journey to the Sanctuary of Saint Rita which has been dedicated to her memory. The city's medieval architectural jewels are worth a visit: the Gothic church of St. Francis, which will astound you because of the beauty of its rose-window and of its ogival portal and the church of St. Anthony Abate, dating back to the 15th century but reconstructed and modified during the baroque era. In the latter's interior, you'll admire a cycle of paintings depicting the life of the Saint. The Collegiate Church of St. Mary is one of the city's oldest buildings: its origins go back to longobard times, even if it has been notably modified because of damage caused by subsequent earthquakes. You'll find impressive works of art in the inside, such as a wooden Cross of the 15th century. The Church of St. Augustine also dated back to the Gothic era; inside, it contains stupendous examples of frescoes of the Umbrian and Perugian schools. The Basilica and monastery of St. Rita are of great storical and religious importance, and have become world-famous religious centers. Finally, Carli Palace, with its interior, is perhaps the building which best represents the city's civil architecture. >> If you've decided to visit Cascia you should contact now farmhouses and hotels in its vicinity >> click this link.